Swipe has just announced the launch date of Swipe Elite Sense, another budget offering from Indian manufacturers. The new smartphone is priced at Rs. 7,499 and will be available only via Flipkart starting 6th of March. This smartphone is going to compete with the likes of Redmi 3s and Coolpad 2.5D Megs as evident from the price tag it holds. 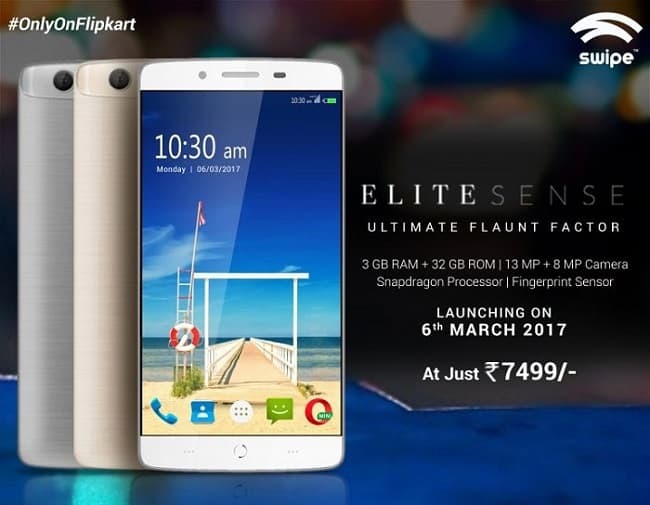 The Elite Sense is a plastic body construction with brushed metal effect provided at the back panel which might look good but the phone's built is compromised. Measuring 72.1 x 142.1 x 9.1 mm and weighing just 146g makes it a comfortable to hold device. It boasts a 8MP front camera and a 5-inch HD 720*1280 IPS display with a pixel density of 294 PPI. The physical navigation keys are provided just below the display which do light up in dark conditions. Coming to the back side of the phone, a 13 MP camera sensor and LED flash are provided at the topmost left corner with a fingerprint sensor. Going under-the-hood, performance of the phone is solely handled by a 1.4GHz quad-core Qualcomm Snapdragon 425 chipset which is smooth enough considering it is clubbed with 3GB of RAM. 16GB of internal storage is provided and further expandable up to 64GB via microSD card. Android 6 Marshmallow is provided, when competition has started rolling out updates for Nougat, that’s a bit disappointing. Connectivity options include support for LTE and VoLTE, Wi-Fi, Bluetooth, GPS, and USB OTG. All this with a 2,500 mAh battery; not going to last a day! The phone will be available in 2 color options: Space Gray and Champagne Gold. On paper, it’s not a competition at all but the actual picture may be different. Impressive specs at the price point they're offering. Xiaomi Redmi series is quite strong in this segment though. The 3S and Prime phones are quite impressive; but looks like Swipe is putting up a stronger fight. They need to do a lot of branding in order to get people's attention. Yup! Indian manufacturers are steping up their game too . Competition (Xiomi) is giving way too much specs at that price, which is really hard to compete with. Still, this SWIPE series needs serious attention. I only have problem with this. Plastic body makes the phone look low-end. I recently checked the Redmi Note 4 64 GB version + 4GB RAM. It has a metallic gold finish. I can't even begin to tell how good it looks. I previously had a Xiaomi Redmi 1S with plastic back cover. It never gave a high-end vibe. Metal bodies stand out. Hands down. Plastic and those dark black bezels surrounding the display. The phone looks so cool when the display is off. Giving an appearance of edge to edge screen. As soos as dsplay lights up; it screams cheap and looks ugly. Coolpad and Le devices follow this design a lot. Thank God! Xiomi is not doing it. PS: With this Sense model, battery is 2500 mah. Redmi 3s-price 7k- battey size 4000+! !